Water is one of the most dynamic substances on Earth, especially when it is moving. For transportation professionals, locations where water meets road can be especially challenging. Hydraulic engineers need to understand the complex interactions between transportation assets and coastal or river environments. Until recently, however, hydraulic modeling tools lacked the sophistication to illustrate water patterns accurately enough for the needs of modern practitioners. The tools have evolved. 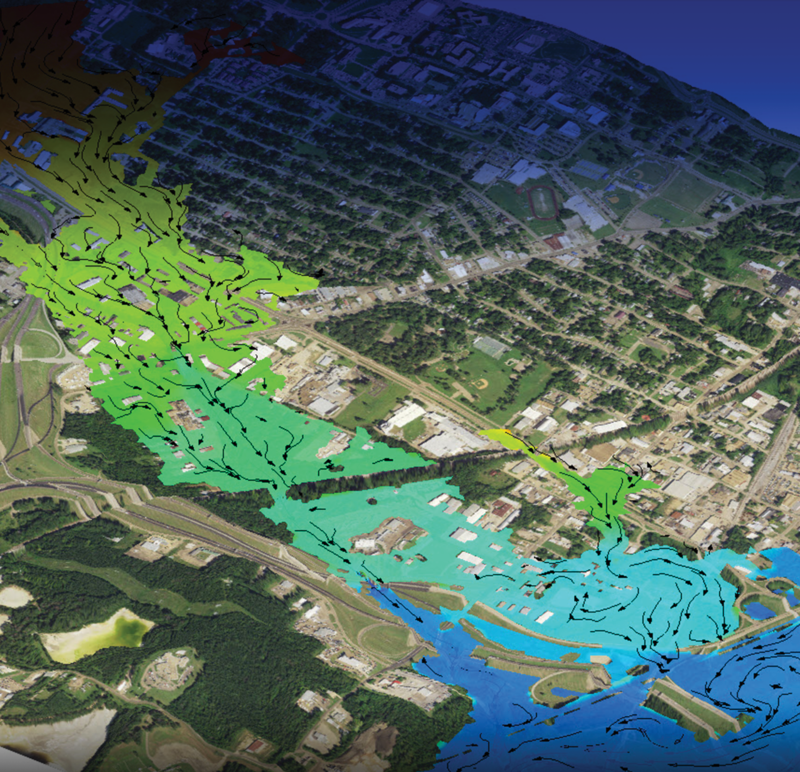 Today’s technology can locate and illustrate patterns of flow discharge, water surface elevations, depth, velocity, and shear stress at high resolution. It also provides realistic three-dimensional (3D) representations of anticipated hydraulic conditions in unprecedented detail. The Every Day Counts round four (EDC-4) team on collaborative hydraulics: advancing to the next generation of engineering (CHANGE) spent the past 2 years promoting these new tools and training practitioners on their use. Scott Hogan, senior hydraulic engineer for the Federal Highway Administration Resource Center and CHANGE team lead, said the response has been significant. The CHANGE innovation will continue in EDC-5, when the team will use a two-pronged approach to advance the technology. “First, we’ll definitely keep helping States progress into using two-dimensional (2D) modeling technology. But for those who have adopted and understand the programs, we will deploy new some tools for EDC-5. We are moving into new territory,” Hogan said. Some States, like Minnesota, have fully adopted 2D hydraulic modeling and are seeing the benefits. 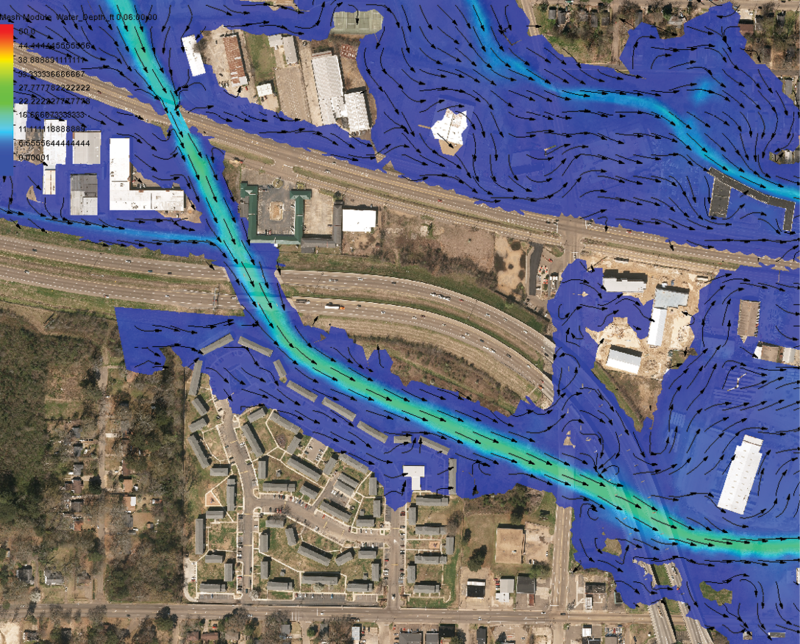 The Mississippi Department of Transportation (MDOT) is another State agency that incorporated 2D modeling into its hydraulic analysis. 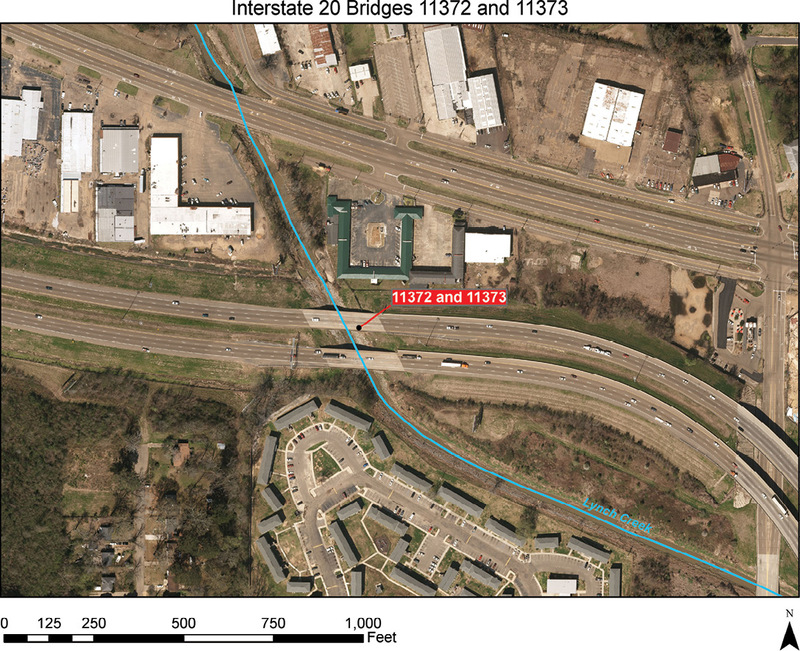 MDOT used it to analyze a particularly complicated project in Jackson. Farmer said the project would have been nearly impossible without 2D modeling technology. “It would have been an absolute nightmare to model Lynch Creek in 1D. And even if we did, the results would have been much less certain because of the limitations of that technology,” she said. As Hogan looks back on his EDC-4 experience and forward to the next round, he credits EDC with the CHANGE innovation’s impact. Ten States and Washington, DC, are now developing implementation plans and learning more about CHANGE. Thirty-one States and FLH are demonstrating and assessing hydraulic engineering tools, and six States have institutionalized hydraulic tools. Watch an Innovation Spotlight video on CHANGE. Watch an EDC-5 orientation webinar on CHANGE. View on-demand videos on collaborative hydraulics. See FHWA’s hydraulic engineering web page for guidance, software, and training information. Contact Scott Hogan of the FHWA Resource Center for information and technical assistance. State Transportation Innovation Councils (STICs) in Colorado, Delaware, and Texas received 2018 STIC Excellence Awards for demonstrating success in fostering a strong culture of innovation among stakeholders. The American Association of State Highway and Transportation Officials and Federal Highway Administration sponsor the annual award to promote innovation nationwide. Deputy Federal Highway Administrator Brandye Hendrickson presented the 2018 awards at the AASHTO annual meeting in Atlanta, GA, in September. Using STIC Incentive funds, the Colorado Local Technical Assistance Program (LTAP) organized a Local Innovation Implementation Summit for participants from 132 local agencies. After surveying agencies to determine the top five Every Day Counts (EDC) innovations to feature at the summit, the Colorado LTAP developed learning sessions on safe transportation for every pedestrian (STEP), road diets, data-driven safety analysis (DDSA), pavement preservation, and road weather management. The summit included exhibits on a range of innovations, including seven local agency projects that were past winners of FHWA’s Build a Better Mousetrap competition. The summit also promoted an equipment loan program for local agencies to support innovation deployment, such as traffic counters for DDSA implementation, pavement temperature sensors for road weather management, and pedestrian counters for STEP efforts. As a result of the summit, local agencies increased requests to the equipment loan program, several agencies expressed interest in developing local road safety plans (LRSPs), and an LRSP peer exchange is in the works. The Delaware STIC and Delaware Department of Transportation (DelDOT) collaborate to foster a culture of innovation among stakeholders at every level. DelDOT’s first Innovation Fair in 2017 showcased nearly 40 innovations agency staff implemented to improve safety and efficiency, cut costs, and save time. DelDOT added high school students to the invitation list for the 2018 fair to introduce tomorrow’s transportation workforce to innovation. DelDOT, the Delaware Department of Natural Resources and Environmental Control, and the Government Information Center partnered with two nonprofit groups to host the 2018 Open Data Challenge. Through the challenge, tech-savvy teams used transportation, environmental, and recreation datasets to develop applications, such as an app to make transportation more accessible for persons with disabilities and an app to make multimodal tourism easier for visitors. The Delaware STIC and DelDOT promote the use of EDC innovations in the State. DelDOT completed a bridge deck overlay using ultra-high performance concrete (UHPC) on the Blackbird Station Road project, showing that UHPC can be used to produce a long-lasting, maintenance-free bridge deck. DelDOT also used UHPC to connect adjacent box girders on the project, which received Accelerated Innovation Deployment Demonstration funds. DelDOT implemented high-friction surface treatments (HFST) as part of a systemic safety improvement program to address roadway departure fatalities and serious injuries. Before-and-after crash data for the first 23 locations where HFST was applied show that roadway departure crashes dropped at 83 percent of the locations. Since being chartered in 2016, the Texas STIC has engaged a wide range of stakeholders in this large urban and rural State. “Through dedicated council members, community stakeholders, and TxDOT’s collaborative approach toward innovation, the Texas STIC is generating lots of excitement across the State as it fosters a culture of innovation,” said Hendrickson. The Texas STIC is housed in the Texas Department of Transportation’s (TxDOT) Research and Technology Implementation Division and sponsored by the Strategic Planning Division to incorporate a multipronged approach to promoting a healthy innovation culture. Using a website, videos, and factsheets to share the mission, vision, and goals of the Texas STIC has attracted a diverse network of innovators. STIC meetings—held in person and by webcast to overcome geographical challenges—typically draw about 70 participants from local agencies, academia, industry associations, metropolitan planning organizations, and other groups. One project the Texas STIC chose for implementation is a proactive signal control system to optimize signal phasing and timing by integrating data from traffic signals, loop detectors, and connected vehicles to reduce congestion and maximize intersection performance. In addition to helping TxDOT prepare for the connected vehicle environment, the system reduced traffic queue lengths by 60 percent and wait times by as much as 50 percent where it was installed. TxDOT is now implementing this system at 30 intersections in the Houston area. The 2019 Summer Transportation Internship Program for Diverse Groups (STIPDG) is now accepting applications for the internship period of June 3 through August 9, 2019. STIPDG provides college and university students with on-the-job experience while working on transportation-related topics. The application deadline is January 22, 2019. For information, see the STIPDG web page or contact Program Manager Yolonda Jordan. Across the country, State Transportation Innovation Councils (STICs) are applying STIC Incentive funds to make innovations standard practice in their States. STICs are using the funds to mainstream innovations such as ground-penetrating radar, accelerated bridge construction (ABC) techniques, data-driven safety analysis (DDSA), three-dimensional (3D) engineered models, and Global Positioning System (GPS) units for construction inspection. The STIC Incentive program offers funding of up to $100,000 a year per STIC to offset some of the costs of standardizing innovative practices by a State transportation agency or other public-sector STIC stakeholder. The Alaska Department of Transportation and Public Facilities (DOT&PF) is using STIC Incentive funds to develop and implement a performance specification for acceptance of asphalt paving compaction based on full-coverage density data collected by ground-penetrating radar (GPR). Recent refinements enable GPR equipment to accurately measure and map compaction of freshly placed asphalt right behind the paving equipment. That means defects that could lead to development of potholes can be identified and fixed during the paving process. 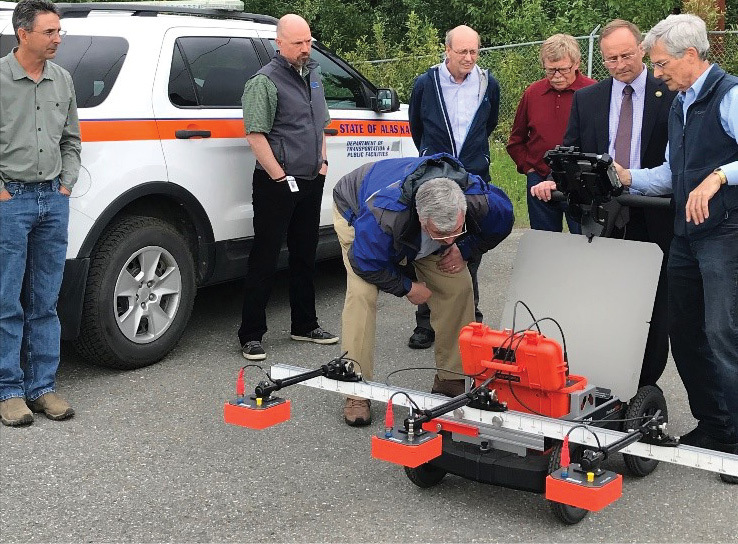 The GPR technology was demonstrated at a June meeting of the Alaska STIC, providing attendees with hands-on experience using the equipment. Alaska DOT&PF expects deployment of a continuous full-coverage compaction specification for asphalt paving to enhance project quality and pavement life. Better quality pavements can improve ride quality for travelers and reduce highway maintenance costs. For information, contact Rich Giessel of Alaska DOT&PF. STIC Incentive funds supported development of a training package and coordinated outreach effort to educate the California transportation community on the methods and benefits of ABC. The training was deployed through presentations and workshops at transportation conferences and a webinar conducted by the California Department of Transportation (Caltrans) Division of Local Assistance. Topics included how ABC differs from conventional bridge construction, a process to identify ABC benefits, various ABC methods that can be used for a successful project, and project examples in California and other States. For information, contact Dorie Mellon of Caltrans. The Michigan Department of Transportation (MDOT) is broadening its implementation of DDSA so that it becomes an integral component of safety management and project development decision making, leading to better investment of resources to enhance highway safety. As part of that effort, MDOT used STIC Incentive funds to develop guidance on using DDSA. The guidance outlines the appropriate level of safety analysis at each stage of project development, including the project scoping, development of project alternatives, and design exception processes. MDOT also created a safety tool matrix and training plan on using safety analysis tools. For information, contact Mark Bott of MDOT. The Ohio Department of Transportation (ODOT) used STIC Incentive funds on a pilot project to provide a 3D engineered model to a contractor for use in constructing an Interstate 71 project. Transferring digital information eliminated the need for the contractor to develop a 3D model from two-dimensional (2D) plans. At the end of the project, ODOT required the contractor to deliver an as-built 3D model, a phased visualization of the baseline construction schedule, and coordinates for uncovered utilities in the right-of-way. The pilot project enabled ODOT to identify steps and resources needed to replace 2D plan sets with 3D models as the standard deliverable to contractors. The project also encouraged collaboration between ODOT offices on other improvements, including efforts to make existing plan sets more interactive and to use future 3D models as an inspection tool in a mobile application. For information, contact Chase Wells of ODOT. STIC Incentive funds are enabling the Oklahoma Department of Transportation (ODOT) to deploy GPS units for construction inspection as part of an e-Construction approach. After attending training sessions, ODOT inspectors are using the units on projects with automated machine guidance specifications to independently verify geospatial positions used by contractors. A key benefit of using GPS units for inspection is that ODOT is able to perform verification tasks with one person instead of the two people required for conventional methods. ODOT also reports that the increased accuracy and mobility of the GPS units are beneficial for verifying earthwork construction. For information, contact John Leonard of ODOT. See more projects on the STIC Incentive Projects web page. Contact Sara Lowry of the Federal Highway Administration Center for Accelerating Innovation for information on the STIC Incentive program. Contact your State Every Day Counts coordinator for assistance with STIC Incentive applications. The Federal Highway Administration announced $8.4 million in Accelerated Innovation Deployment (AID) Demonstration awards to transportation departments in Arizona, Florida, Illinois, Iowa, Minnesota, New Hampshire, New Jersey, Oklahoma, and Utah. Projects will be underway soon in each State to improve the safety and operational efficiency of roads and bridges using cutting-edge pavement materials, engineering techniques, and connected-vehicle technology. Since the 2014 launch of the AID Demonstration program, FHWA has awarded more than $60 million to help Federal, State, local, and tribal government agencies use innovative traffic, safety, and construction practices. The Arizona Department of Transportation (ADOT) will use AID Demonstration funds to advance data collection for transportation operations in communities along the Sun Corridor from Phoenix to the State’s borders with Mexico and New Mexico. ADOT will use the data to improve transportation investments and streamline environmental reviews. The Florida Department of Transportation will test connected vehicle technology to improve safety for bicyclists and pedestrians in Gainesville. The technology will provide bicyclists and pedestrians with real-time traffic information and enhance the city’s “SmartTraffic” system. The Illinois Department of Transportation and Williamson County will use warm-mix asphalt (WMA) on a Saraville Road resurfacing project. WMA provides benefits such as lower paving costs and improved working conditions because of reduced exposure to fuel emissions. The Iowa Department of Transportation will implement bridge bundling, an innovative contracting method to quickly and cost-effectively replace up to 14 structures on the State’s secondary road system. The project will demonstrate the use of newly developed standard plans for precast, prestressed short-span structures with ultra-high performance concrete (UHPC) connections. The Minnesota Department of Transportation will construct a signalized restricted crossing U-turn (RCUT) intersection on Trunk Highway 65. An RCUT intersection improves safety by eliminating left-turns and through movements from cross street approaches. The New Hampshire Department of Transportation (NHDOT) and the town of East Kingston will use UHPC connections on a bridge rehabilitation project. UHPC creates strong, long-lasting connections for successful construction using prefabricated bridge elements. The city of Dover, NH, will use automated traffic signal performance measures to improve safety and reduce traffic delays caused by poor traffic signal timing. The technology will allow traffic management based on real-time traffic flow data and coordination with NHDOT’s traffic management systems. The New Jersey Department of Transportation will launch a weather-savvy roads pilot program to improve roadway safety and operational efficiency. The program will use an integrating mobile observations strategy to deliver real-time information about changing weather conditions from road maintenance vehicles to existing data sensors throughout the State. The Oklahoma Department of Transportation will construct the State’s first diverging diamond interchange (DDI) in Elk City. Implementing a DDI will reduce the number of vehicle conflict points and improve safety and mobility compared to conventional interchanges. The Utah Department of Transportation will expand the State’s use of 3D engineered models, e-Construction, and other state-of-the-art techniques that improve the accuracy and cost-effectiveness of project planning and preliminary engineering. View the AID Demonstration project map. Contact Fawn Thompson of the FHWA Center for Accelerating Innovation. The Nation’s first high-friction surface treatment (HFST) using calcined bauxite mined and calcined in the United States was installed on an Arkansas Department of Transportation project on Highway 64 in Crittenden County. A cost-effective safety countermeasure that significantly increases skid resistance and reduces crashes, HFST uses calcined bauxite aggregate (manufactured in a high-temperature kiln) bonded to the pavement with a polymer resin binder. The Florida Department of Transportation (FDOT) and local transportation agencies continue to implement automated traffic signal performance measures (ATSPMs) to manage traffic more effectively and improve mobility. After the initial installation of 22 signals on the U.S. 90 corridor, the city of Tallahassee expanded ATSPM implementation to 40 more signals. The city plans to address the challenge of data consumption by moving to virtualization, which allows for a physical server to host one or more virtual servers, reducing hardware costs and improving system robustness and adaptability. After exploring several noise abatement solutions, the Texas Department of Transportation (TxDOT) constructed a Next Generation Concrete Surface (NGCS) on Interstate 10 near Houston to address residents’ concerns about tire-pavement noise. Developed by Purdue University and installed in 16 States, NGCS is a pavement preservation treatment that combines grinding and grooving to create a texture that improves ride quality and lessens the amount of noise vehicles make on roads. Traditionally, agencies used only grinding for concrete pavements. After NGCS texture was installed, TxDOT received positive feedback from the public and elected officials about tire-pavement noise reduction. TxDOT expects to place several million square yards of NGCS in the Houston area to provide a smoother, quieter driving experience. The city of Broken Arrow installed a passive pedestrian-activated RRFB in the Rose District (above). A Tulsa road diet (below) reuses roadway space to create parking and curb extensions that shorten the distance for pedestrians to cross. As walking becomes an increasingly popular transportation mode across the country, Oklahoma is making strides in bringing agencies together to make communities and highways safer for pedestrians. Led by the Oklahoma State Transportation Innovation Council (STIC), the State is deploying countermeasures to improve safety at uncontrolled crossing locations promoted in the Every Day Counts safe transportation for every pedestrian (STEP) initiative. Pedestrians account for more than 17.5 percent of traffic fatalities, and the majority of those deaths occur at uncontrolled crossing locations, such as midblock or unsignalized intersections. The Oklahoma Local Technical Assistance Program (LTAP) organized STEP classes for local engineers and planners in 2017. “Lots of agencies in the State are getting on board with STEP, and it’s exciting to see the enthusiasm of our partners,” said ODOT Bicycle and Pedestrian Coordinator Shelby Templin. After the training sessions, Templin assembled a committee to develop an Action Plan for Implementing Pedestrian Crossing Countermeasures at Uncontrolled Locations. “The document will provide guidance for ODOT employees, as well as for communities ready to take the next STEP in pedestrian safety,” said Templin. 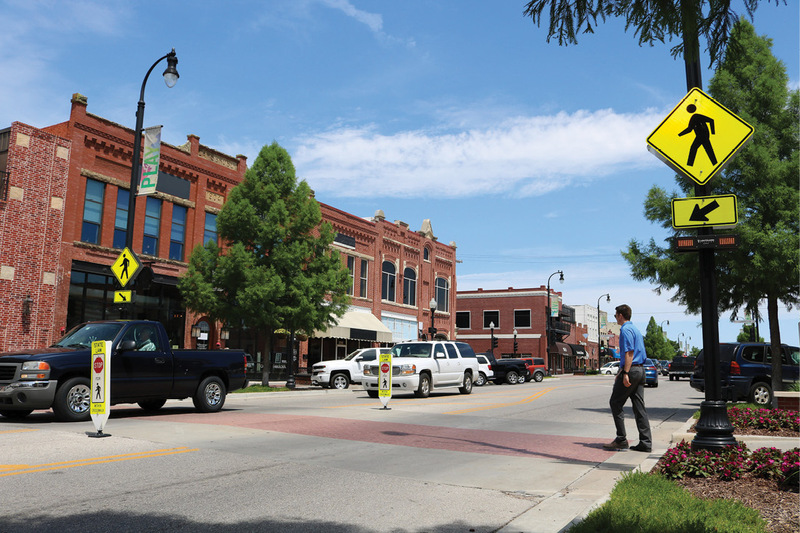 A roadway reconfiguration known as a road diet is being used with greater frequency in Oklahoma as municipalities and ODOT look at solutions to reduce pedestrian crashes. A cost-effective road diet enhances safety, mobility, and access for all road users. The city of Broken Arrow has embraced road diets, curb extensions, and RRFBs, especially in the Rose District. 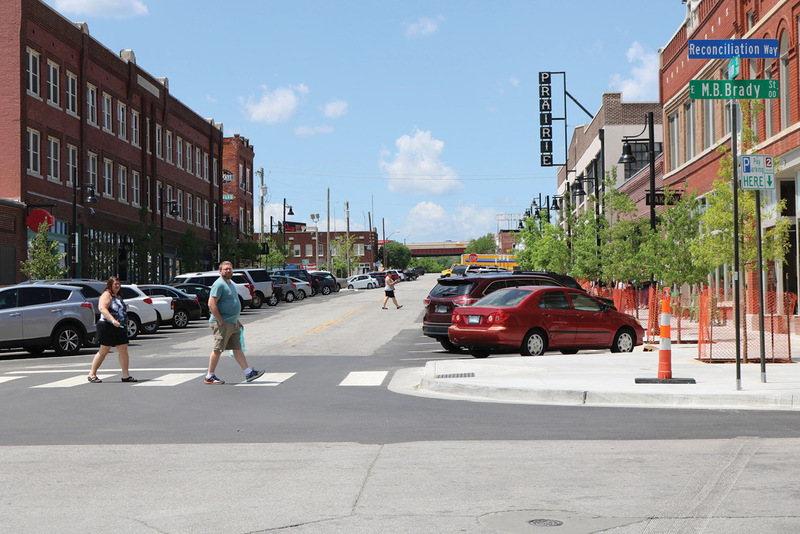 “The curb extensions, road diets, midblock crossings, and streetscape design all contribute to the urban placemaking feel we’re going for,” said Broken Arrow Special Projects Coordinator Farhad Daroga. The placemaking concept uses a collaborative planning process to shape public places that maximize a community’s shared values. Future pedestrian improvements in Oklahoma include a road diet, pedestrian hybrid beacon, and pedestrian refuge island on State Highway 128 in Heavener. Mountain View and Chattanooga will add curb extensions. Tulsa streets slated for road diets with bike lanes include 3rd Street and Lewis and Harvard Avenues. The Pawnee Nation will address pedestrian safety concerns on State Highway 18 with the tribal government’s First Street safety project, which will incorporate pedestrian-activated traffic devices, lighting, and advance warning signs to enhance the visibility of pedestrians as they cross the highway that separates the community from services, schools, and jobs. Read about Oklahoma’s STEP program on the Oklahoma Tribal Tech Initiative website. Contact David Ooten of ODOT for information on Oklahoma STEP. 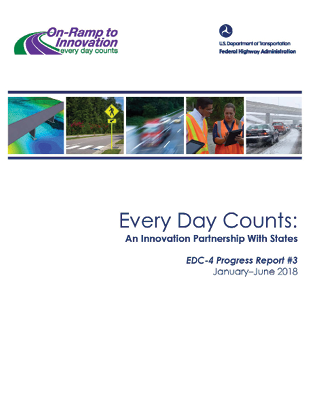 EDC-4 Progress Report #3 summarizes the status of innovation deployment for the 11 innovations in the fourth round of Every Day Counts as of June 2018, three-quarters of the way through the 2-year cycle. Read deployment highlights for each innovation and view maps and charts to learn how innovation implementation is advancing in States across the country. Watch recordings of the introductory webinars on the 10 innovations in Every Day Counts round five (EDC-5). Each 90-minute webinar provides an overview of an EDC-5 innovation, examples of how the innovation is being used in transportation programs, and resources available to help deploy the innovation in 2019 and 2020.